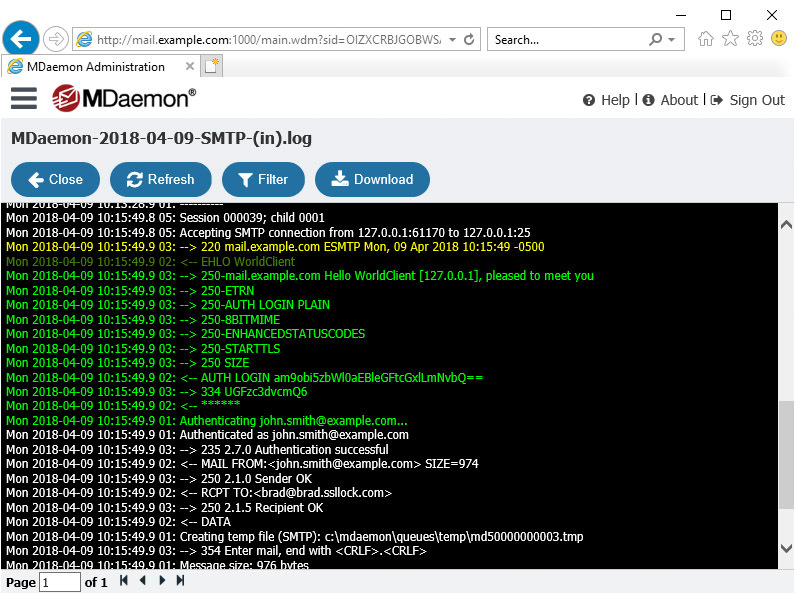 MDaemon Remote Administration, a convenient remote administration tool included with MDaemon Email Server, provides administrators access to most of MDaemon's features from any computer with a web browser and an Internet connection. 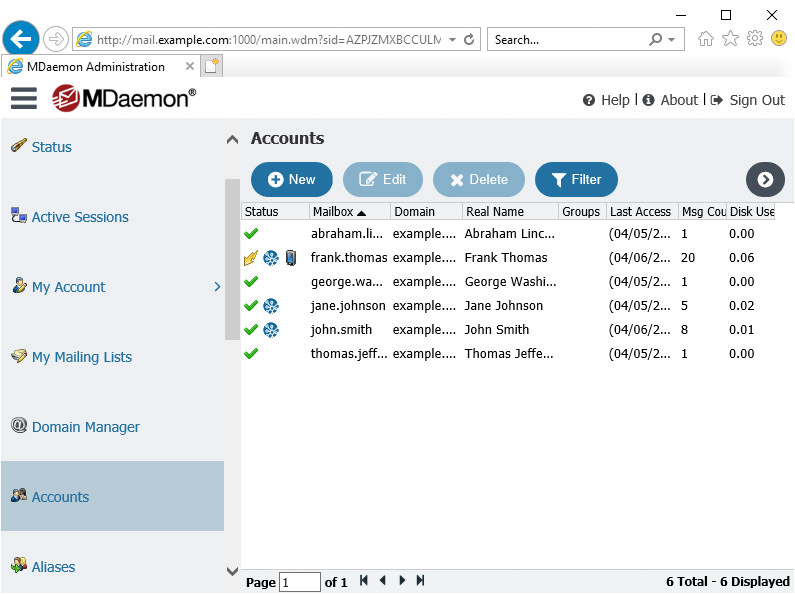 MDaemon Remote Administration allows you to do everything from adding or editing accounts, to directly editing Configuration files, to reviewing logs for troubleshooting mail delivery issues, and so much more. 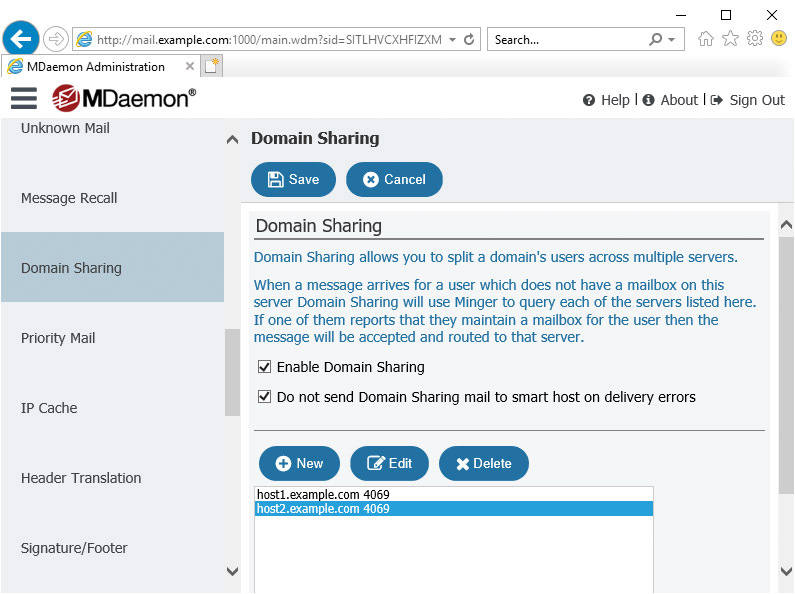 With MDaemon's built-in SSL capabilities, Remote Admin can even be accessed via a secure connection using HTTPS. Leave the office with the confidence that you are still in control of your messaging. 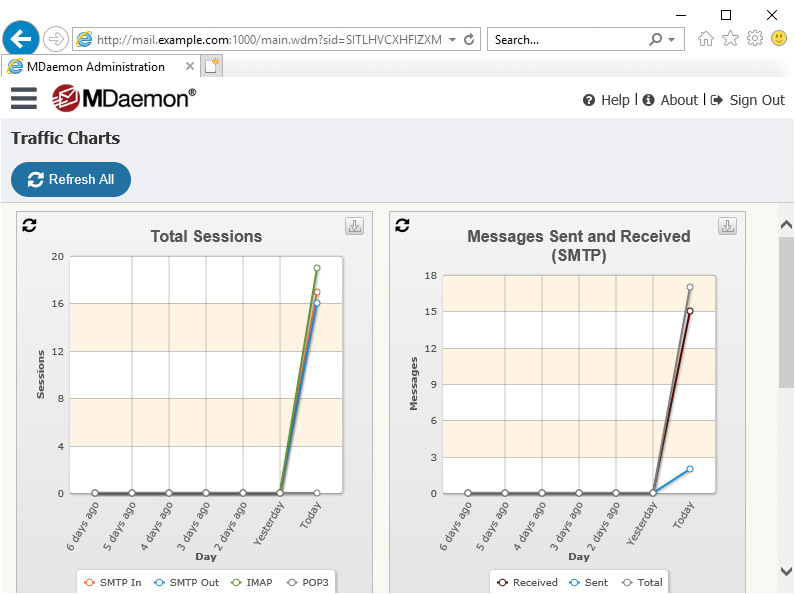 MDaemon Remote Administration allows you to view the current status of your MDaemon server, and statistics for users, domains, lists, and gateways. Administrators can add accounts manually or import them from a CSV file. Account-specific settings can be adjusted, including alias configuration, adding an account to a mailing list, managing shared folders, forwarding mail, setting quotas, enabling an auto-responder, and much more. New domains can be added, and existing domains can be configured or updated via Domain Manager. Using Remote Admin, you can configure message size limits, update host names and IP addresses, enable automatic deletion for old messages or accounts, and much more. All port designations and Event timeouts can be configured in Remote Admin, allowing MDaemon to communicate with firewalls, routers or switches that might be listening for various protocol activities on different ports, and helping to ensure that a connection does not time out on slower connections. Message archiving allows all inbound and outbound messages to be copied to a designated archival address, or to designated folders. Custom access levels for these folders can be granted to specific users, allowing only those who are authorized to access the archive. Public and shared folders provide a central repository for email messages, documents, contacts, tasks, and notes. 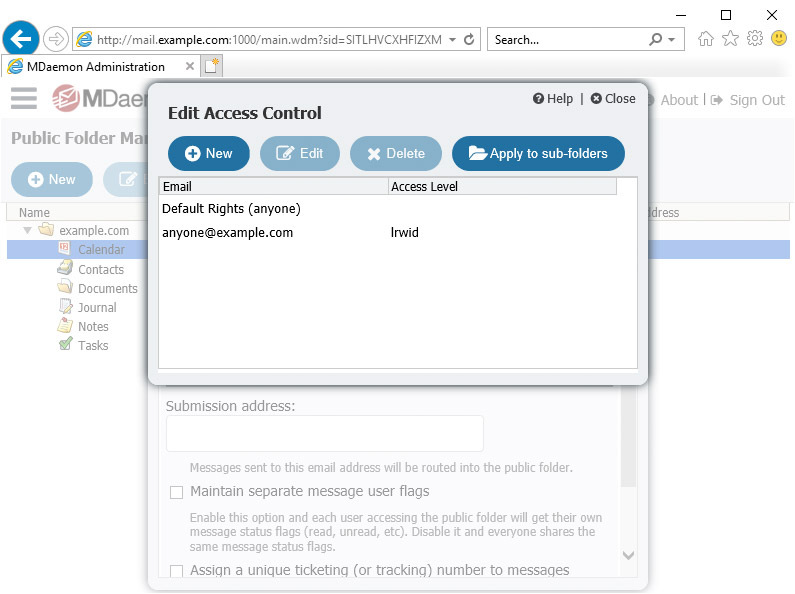 Users can be granted read-only, edit, or full access rights to specific folders, allowing the MDaemon administrator to delegate folder access to only those who are authorized. All MDaemon configuration files are stored in the MDaemon/App directory on the server. 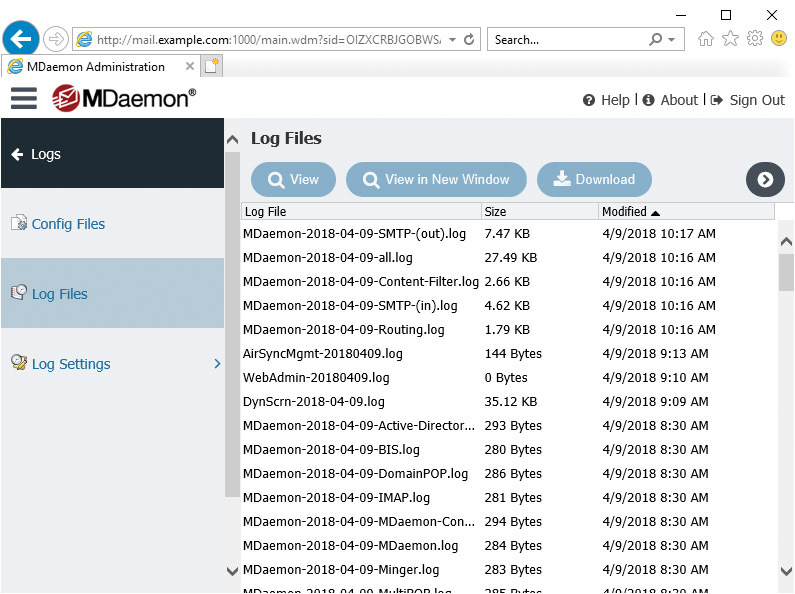 With MDaemon Remote Admin, you can access and edit these files from any computer with a web browser and an internet connection. 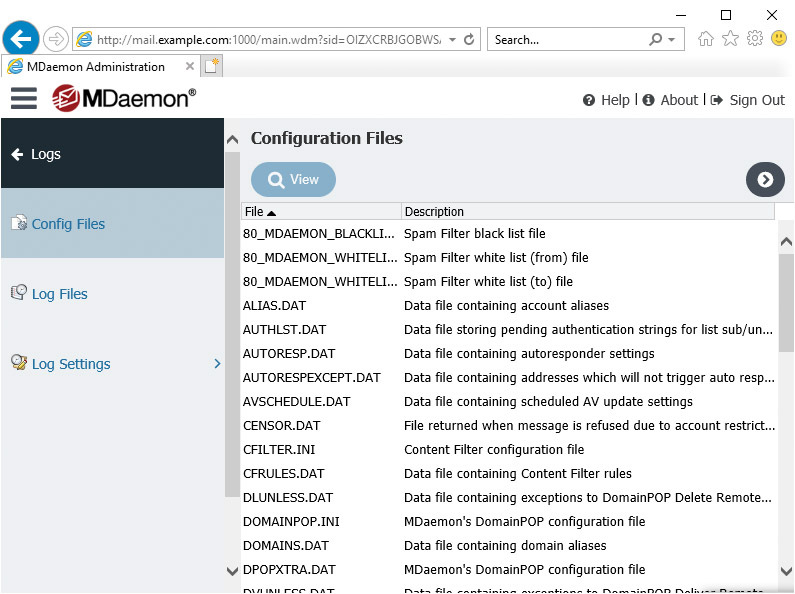 All MDaemon settings are stored in these configuration files, so having access to them from any location allows greater control and granular customization of all settings. 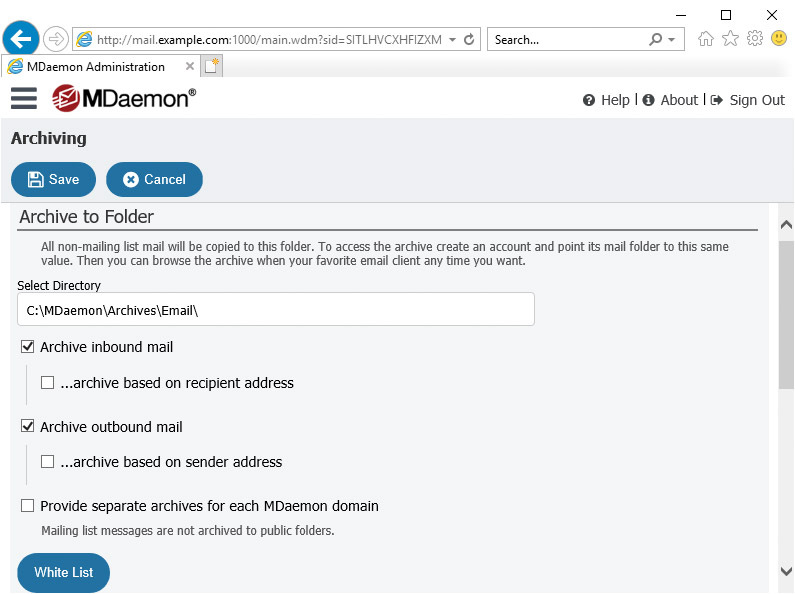 All MDaemon logs can be accessed from Remote Admin, allowing you to troubleshoot mail delivery issues while away from the office. The mail routing information that is displayed via the Log / Config Files tab is displayed in Colorized Session Logs. This allows protocol commands and errors to stand out for easier review and troubleshooting. Administrators can select "Traffic Charts" or "Mailbox Charts" within the Status menu to gain a graphical view of basic email patterns, top users and other key stats. The information can be exported as image or .pdf files. 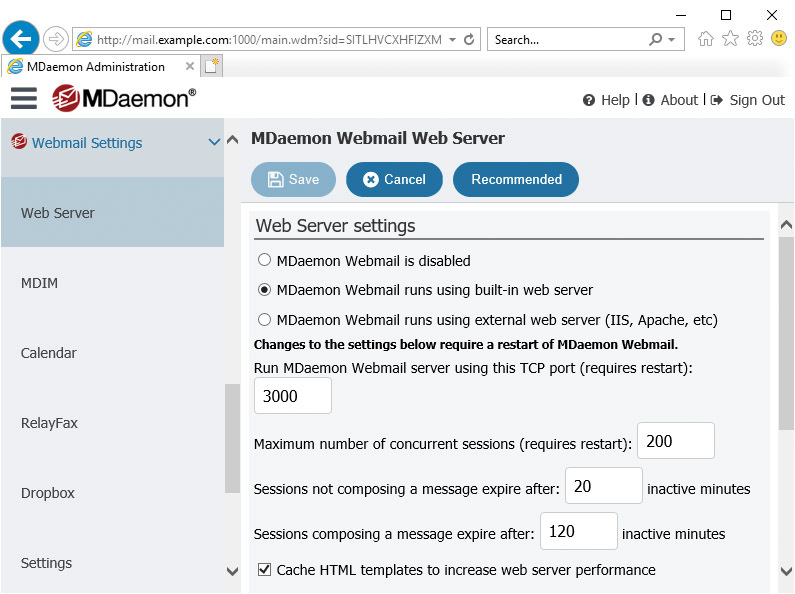 Webmail Server Settings in Remote Admin, allows administrators to enable or disable MDaemon Webmail, change the Webmail port, restart Webmail, custom brand the GUI with your logo, and modify other Webmail settings. 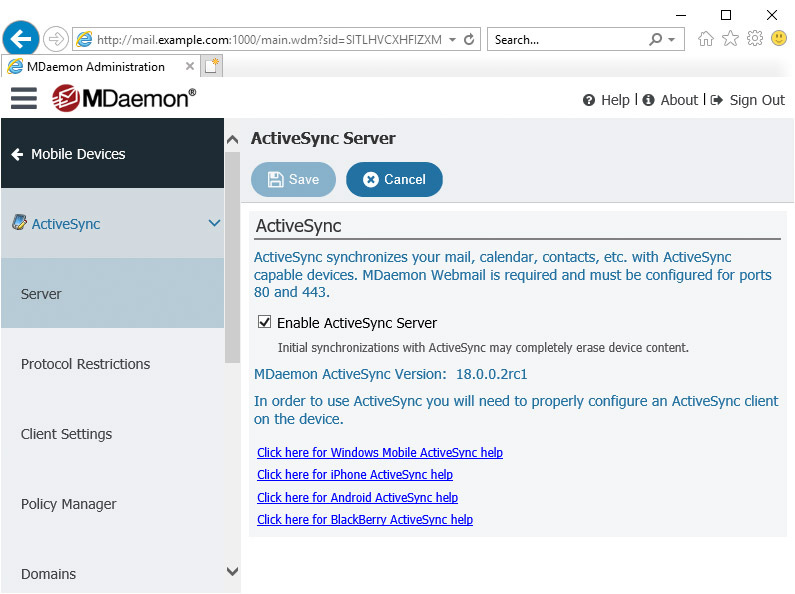 All mobile device management features, including ActiveSync, SyncML, BIS and BES, can be configured from within the Mobile Device Management menu in MDaemon Remote Admin. 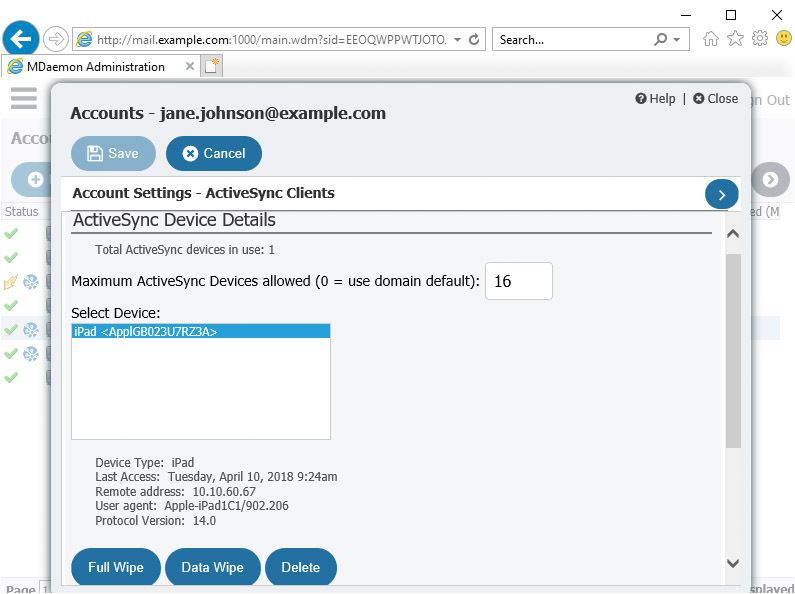 Soft Wipe (via ActiveSync) removes data for the ActiveSync account versus restoring the device to default condition if a device is lost or stolen. 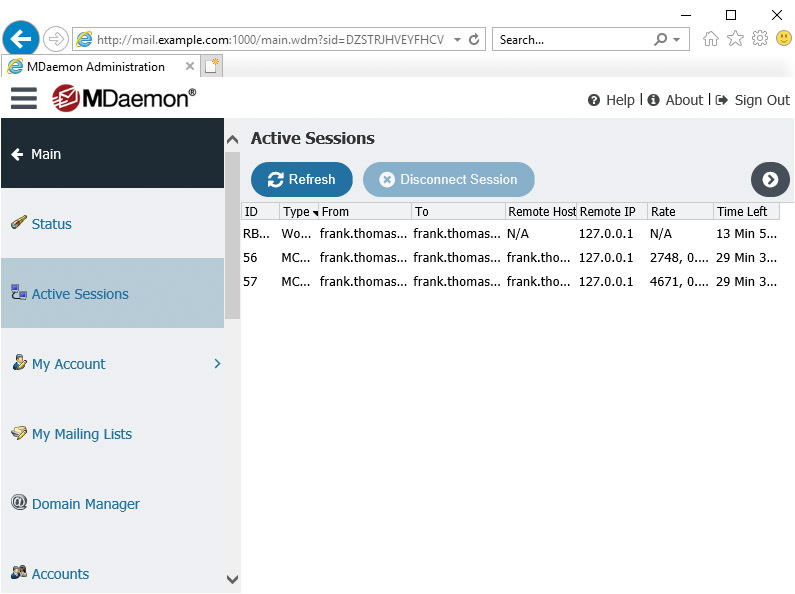 This action can be taken from within the MDaemon console or MDaemon's web-based Remote Administration application. Icons in the Account Manager allow administrators to see at a glance which users are ActiveSync users and which ones are MDaemon Connector users. The Holding queue allows you to review any messages which cause software exceptions during AntiVirus, AntiSpam, or Content Filter processing. You can read more about the Holding queue here. 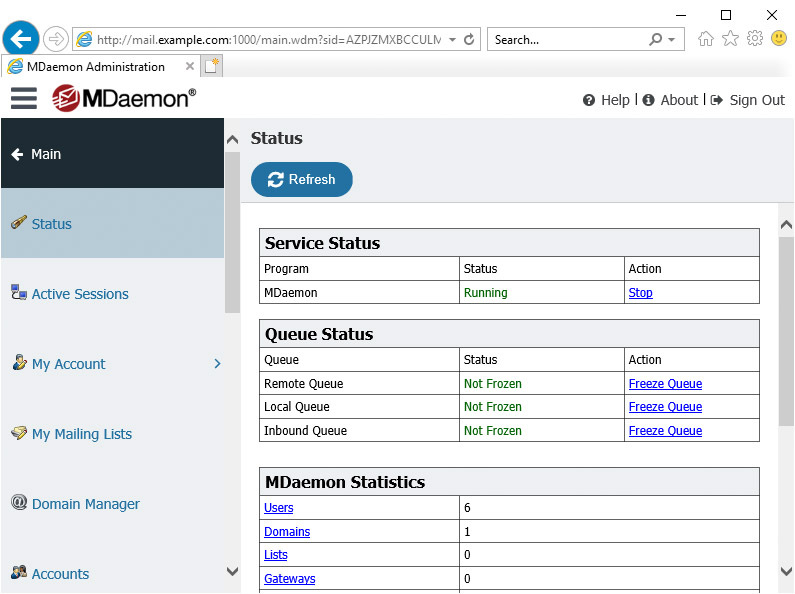 Additional Queue Management features allow administrators to view MDaemon's mail queues, freeze the queues, and move messages to and from the queues. This allows greater flexibility when troubleshooting mail delivery issues. When viewing the Bad Message Queue in Remote Administration, administrators can determine why a message was placed in the Bad Queue by viewing information under the Bad Queue Reason column. This information can be helpful for troubleshooting mail delivery issues. 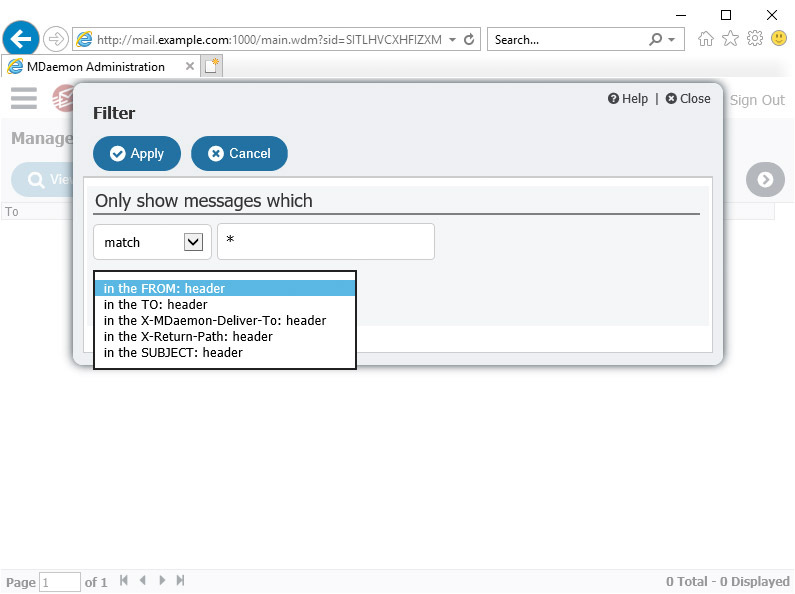 Each Message Queue includes a search function that allows administrators to filter messages in the queue by sender, recipient, subject, and various other headers. Wildcards can be used in search queries for a broader search scope. 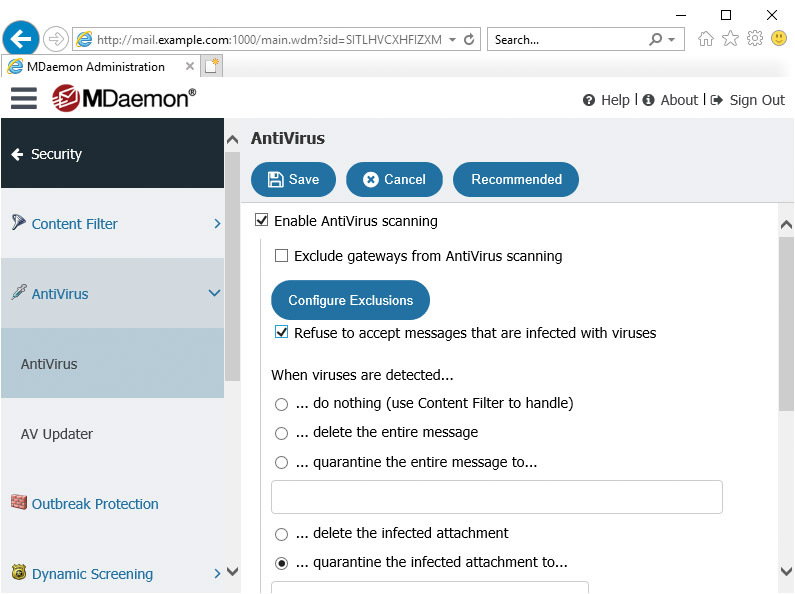 The AntiVirus configuration screen allows you to enable antivirus scanning for mail traffic and customize actions taken to infected messages when MDaemon AntiVirus is enabled on the MDaemon server. Flexible Outbreak Protection settings can be configured from within Remote Admin via the Security menu. Outbreak Protection is an anti-malware component of MDaemon AntiVirus. Domain Sharing allows you to host accounts for a domain at different locations. A practical use for this feature would be in a situation in which you have a branch office and would like to host accounts for that branch on a separate MDaemon server at that location. MDaemon uses the Minger protocol to query the remote server to validate accounts. 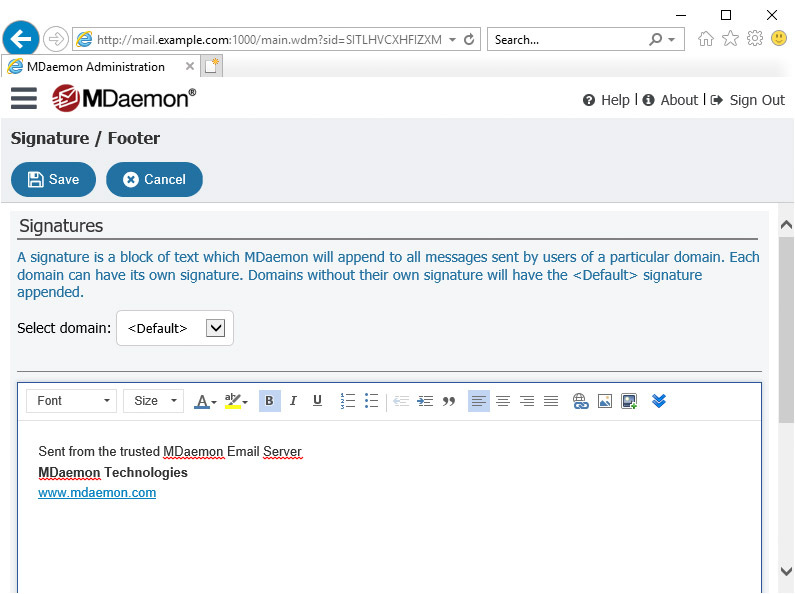 Using Remote Admin, administrators can insert an HTML signature at the end of all messages sent by users of a particular domain, enabling company-wide signature blocks for all users. HTML signatures can be formatted with custom fonts and colors, and can also include images, hyperlinks, and other formatting elements. Images can be added via a button on the Signature/Footer editor, or by using a special macro. 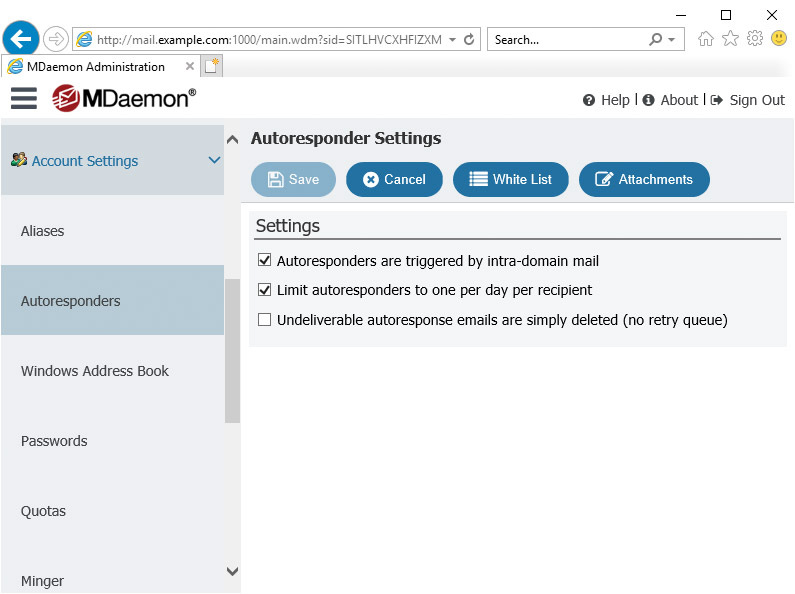 Auto-responder settings are now accessible from MDaemon Remote Administration, allowing administrators to configure the auto-responder white list and other auto-responder options. 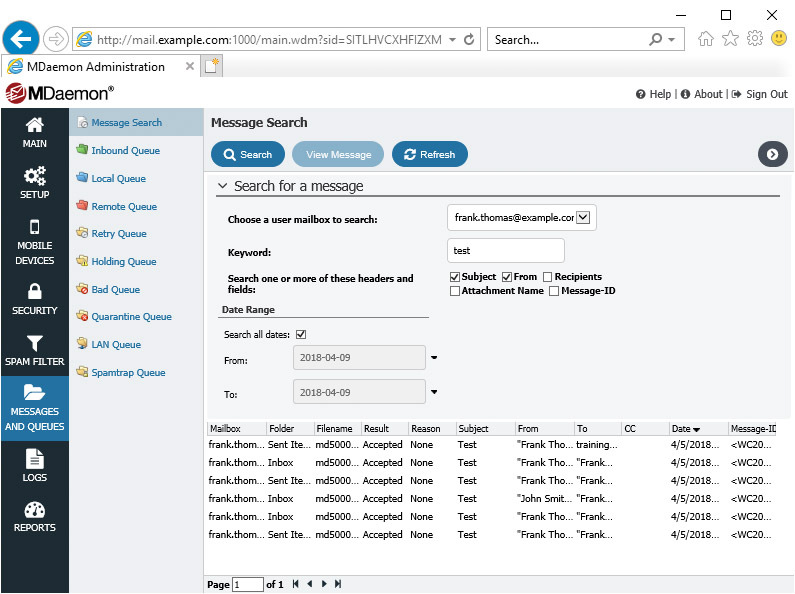 Message Search allows administrators to search a single user's messages based on keywords in the sender, recipient, subject, or attachment name. Searches can be performed on all messages, or only messages within a specified date range. 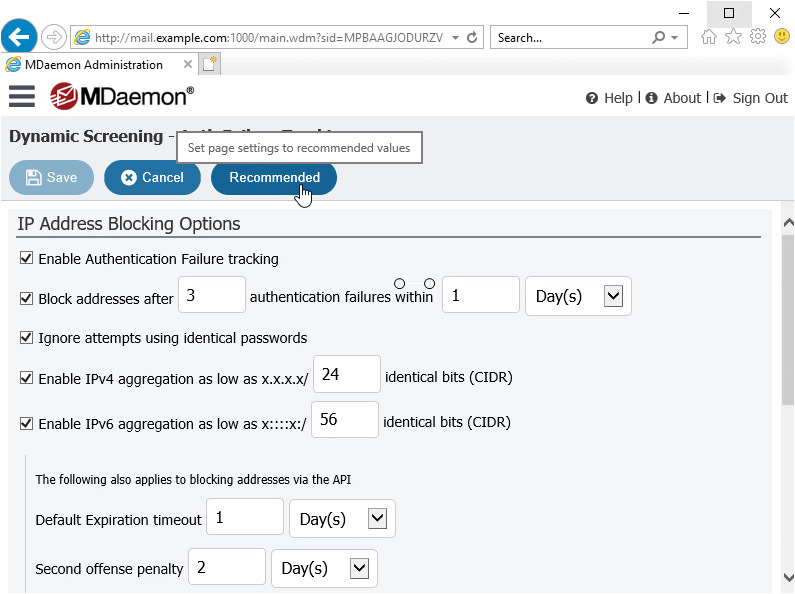 If you have adjusted MDaemon's security settings over time and are unsure of the best settings for optimal security, you can set each security feature to its recommended setting with a single mouse click in MDaemon Remote Administration. Remote Administration users can enable the Remember Me feature to automatically login without having to enter a username and password. The Remember Me duration can be configured by the administrator for up to 365 days. MDaemon Remote Administration is offered in several different languages. Click here for the full list.